Wow. That's basically my review for Ethan and Joel Coen's return to the big screen. And have they ever returned in a big way--to their roots which started with Blood Simple. Violence, betrayal, murder and a truly morbid sense of humor. That was what worked in Blood Simple and it works for them again in No Country for Old Men. I can now forgive them for The Ladykillers, Intolerable Cruelty (which was so intolerable for me that I couldn't get through the whole movie even after three separate tries) and O Brother, Where Art Thou? OK, the last one wasn't THAT bad, but it certainly didn't live up to the standards set by Raising Arizona, The Big Lebowski, Fargo or The Man Who Wasn't There. That was the Coen Brothers I know and love--and boy are they ever back! The story is basically this: a drug deal gone bad, a not so innocent bystander stumbles upon two million dollars worth of drug money and is hunted by various and deadly serious (or perhaps more accurately seriously deadly) parties to get the money back. Or as it's put in the movie: "It's a mess, ain't it Sheriff? If it ain't it'll do 'til a mess gets here." Josh Brolin is terrific as Llewelyn Moss, who sets off the violent chain of events when he finds a case filled with money. He is hunted by a stupendously creepy Javier Bardem. Freddy Krueger, Jason and a herd of flesh-eating zombies don't come close to the scariness that is Bardem's portrayal of Anton Chigurh. A craggy Tommy Lee Jones plays the world-weary, but worldly-wise Sheriff Ed Tom Bell and Garret Dillahunt does a fine job as his deputy, Wendell. 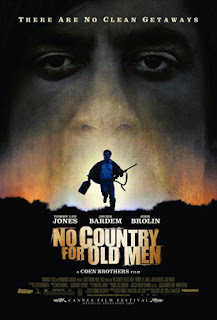 With a great cast that also includes brief appearances by Woody Harrelson playing a mercenary named Wells sent to "control" the uncontrollable Chigurh and Stephen Root as the man who hires Wells (seriously--that's his IMDB credit! ), I have to remark on the remarkable Garret Dillahunt. I first notice him in The Assassination of Jesse James by the Coward Robert Ford and thought--who is this guy? Where have I seen him before? Fact is despite a long list of supporting roles, I had NOT seen him before--but since then I've been seeing a lot of him. Just weeks later, he was guest starring in an episode of Life and last night I caught him when I watched The Believer on DVD. He does great work and I'm looking forward to seeing more of him on screen. again for god knows what. Well. Old age flattens a man. Later, when the two come upon the crime scene of the drug deal gone wrong in the desert, Wendell notices two of the dead wearing suits and says, "These boys appear to be managerial." And toward the end of the film, Llewelyn's wife Carla Jean calls the Sheriff for help, but first asks if the story he told her as a warning to what might happen to Llewelyn was true to which Bell replies, "Well, I, uh...True story? I couldn't swear to ever detail but...it's certainly true that it is a story." And it is certainly true that No Country for Old Men is a story as well--and what a story it is! A definite must-see. DWTS - The Driver beats the Diva! DWTS - Who Made it to the Finals? Bill O'Reilly is a Putz! Note to Santa: Drops some lbs.! Happy Two Year Anniversary to Me!